May 2012: The Mango Tree is now 7 years old. Thanks to all our guests for your comments and suggestions. We have been busy making improvements and now have rooms to suit every budget from 6 bed dorms to budget private rooms and our 4 brand new luxury double rooms offering hotel standard comforts looking out onto a patio garden. We have added an extra communal bathroom and an additional cleaner to keep the place sparkling clean. Our location is unbeatable: one block from Ipanema beach and a stones throw from the Metro, bars, restaurants and shops of vibrant Rio neighbourhood. The Mango Tree is set in a 1930s colonial style house in a quiet residential area, where we offer a relaxing place to sleep, meet other travelers, and sip a chilled caipirinha. 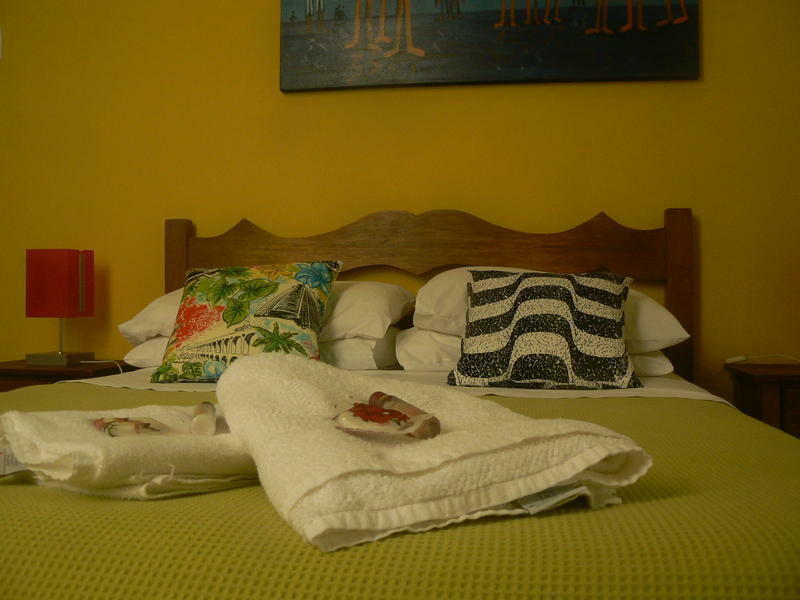 Here you will find the comforts of a guest house (sprung mattresses, 100% cotton sheets, towels, and a real Brazilian style breakfast) combined with the warm welcome and atmosphere of a backpacker hostel. Our house has 5 luxury double rooms, 3 budget ensuite private rooms, 3 private rooms without ensuite and 5 dorm rooms all with 6 beds. All our rooms have air-conditioning and ceiling fans. Our double rooms come with complimentary bottled water, soap, shampoo and conditioner. The dorm beds have extra thick mattresses and our showers are serviced by gas heated hot water for better pressure and no dodgy wiring! Communal facilities include: our bar, patio gardens, fully equipped guest kitchen, bbq, tv room with free dvds, free internet and WIFI, surf board rental. Start each day by enjoying your breakfast outside in our covered dining area before heading out for a day of sightseeing, adventure sports, or simply lazing around on Ipanema beach, which is only 50 metres away. On returning, why not sit around the garden sipping on capirinhas or fall asleep in a hammock underneath the mango tree. Check your email on our free internet access, enjoy DVD's in the common room, or sit in the lobby and enjoy a game with your friends. If it is a specific trip you are after such as Sugarloaf Mountain, Corcovado, hang gliding or a tour of a Favela, then talk to our helpful English-speaking staff who can provide travel information, book tours and make recommendations. We look forward to seeing you at The Mango Tree. IMPORTANT: If making a reservation for New Year or Carnival there is a minimum stay. We also require advance payment in full; the details on how to do this will be emailed to you after you have made your enquiry. We are 1 block from Ipanema Beach, and 80 metres from Posto 9. If you make your way to the corner of Prudente de Moraes and Vinicius de Moraes you will find the Garota de Ipanema restaurant (Girl From Ipanema). From here walk 30 meters along Prudente de Moraes towards Copocabana and you will find us on your left. From the Rodoviaria Novo Rio take the REAL bus to the Hotel Sol Ipanema (Posto 9) on Ipanema beach. Walk one block away from the beach on Vinicius de Moraes, cross at the lights, turn right and the hostel is 60m on your left by the bus stop.